We are going to play a little game. We will search inside the Native Windows Application Programming Interface (API) for functions that used internally by the Windows 7 operating system. The use of such functions is not suggested by Microsoft. We are not only going to uncover such functions, but also we will use them and we will examine their results. The Native API is behind the Base API that Microsoft suggests to use for compatibility and portability reasons. The Native API is the last layer (in user mode) that performs direct calls to the windows kernel mode and more specific to the NTOSKRNL.EXE that is the core windows kernel. I must say that, in my opinion, the method of checking the API of windows is not the easiest thing. I could say that it is more difficult than this in Linux while windows source is not available. Its a closed source. How then is possible to study a specific API function? Only disassembly code can be extracted by processes that are not belong to core kernel. In case that we want to debug kernel, we will need special programs (a windows kernel debugger for example), but this is beyond the scope of this article. We will see from a user-mode point of view the procedures and functions (even undocumented) inside the Native API, aka ntdll.dll. A question that one might ask, is: But why we do this? 1. It is a very good elementary lesson for the wannabe operating systems reverser's. 2. We will learn how to administer our operating system's basic internal actions. 3. We will see live the operation of the (somehow) cryptic native windows API. What knowledge is required to read this article? 1. Elementary knowledge of some reversing techniques, for example how to use Olly debugger. 2. Little (yes little!) knowledge of assembly. We will meet inevitability a lot of assembly code in our trip but I am not willing to make this article an assembly listing with explanations! We will see how to achieve our goals without the need to be an assembly programmer. The native API is implemented inside the ntdll.dll that is located in c:\windows\system32. For the shake of safety lets copy this dll to a work directory say d:\work2. Every test is presented here is performed in a box with Windows 7 Ultimate 64bit. What I am going to do now is to extract every single function that this DLL contains and to (randomly...?) choose one to examine. In order to extract all the exported functions of ntdll.dll I will use the program dumpbin that is come with Visual Studio 2008.
and I create (through redirection) the file exports.txt that contains all the functions that ntdll.dll exports. Hmm... there is a function named RtlGetVersion that is located at RVA (Relative Virtual Address) 3859Α. 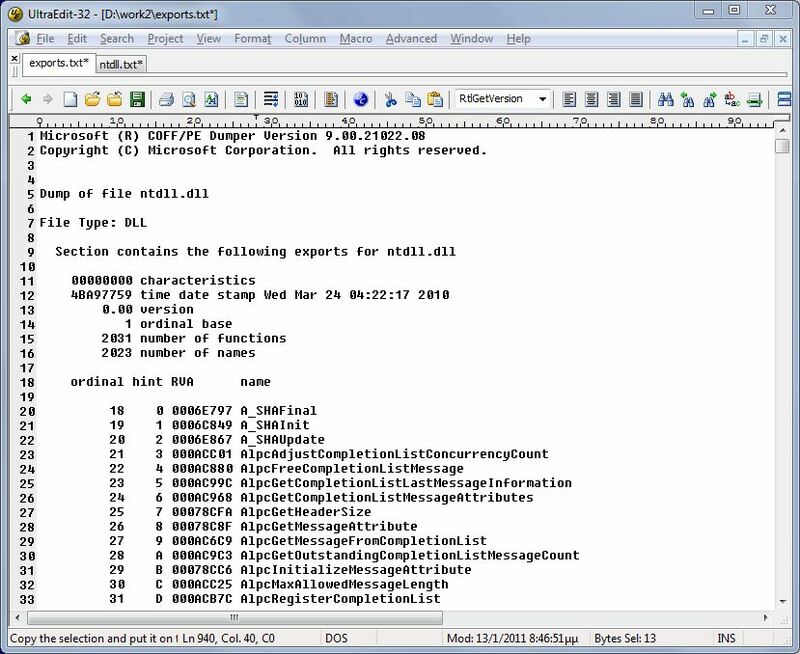 The RVA is the relative address that the RtlGetVersion function will be loaded when the dll will be loaded into memory and thus gets a Base Address. If, for example, the RVA of a function is 15 and the dll will be loaded at position 100 then the function will be located at address 115. 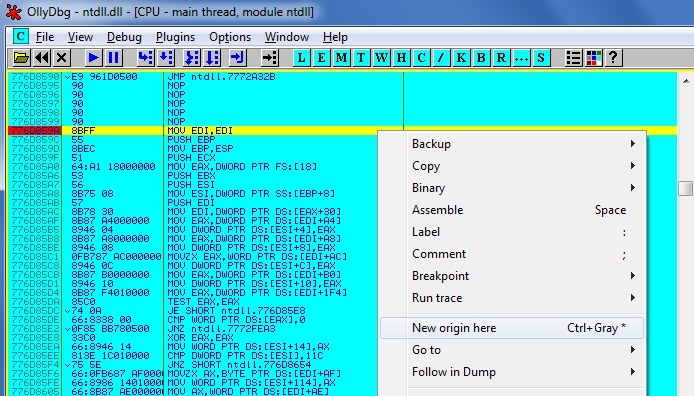 The file ntdlldisasm.txt that I create contains the whole assembly code of ntdll. Its a small source file of... 17Mb! Now, I have to search in this file for my RtlGetVersion function. I already have the RVA. its 0003859A. But what is the IMAGE_BASE_ADDRESS of ntdll? D:\work2>dumpbin /headers ntdll.dll | find "image base"
So 7DE70000 + 0003859A = 7DEA859A. which means that my function RtlGetVersion located at address 7DEA859A. I present this code just for the shake of knowledge and I am not to go in a line by line explanation as I promised. I am going to do something more practical: I will execute the above code using Olly debugger and I will examine the results. Ok, it sounds interesting, but how can I call the specific function that is inside a DLL? With Olly this is easy. Before I start, I want to check the documentation of this function. Indeed here is the documentation that microsoft provides. The RtlGetVersion routine returns version information about the currently running operating system. the dwOSVersionInfoSize member of the structure to the size in bytes of the structure that is used. in the Windows SDK that shows how to get the system version. As we can see, this function has no input arguments and once it is called returns its results to the structure RTL_OSVERSIONINFOW. The definition in this structure is here. Specifies the size in bytes of an RTL_OSVERSIONINFOW structure. This member must be set before the structure is used with RtlGetVersion. Identifies the major version number of the operating system. 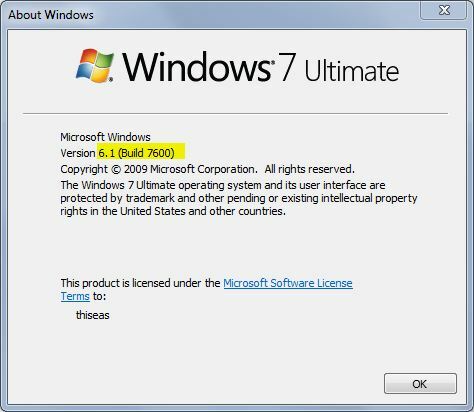 For example, for Windows 2000, the major version number is five. Identifies the minor version number of the operating system. For example, for Windows 2000 the minor version number is zero. Identifies the build number of the operating system. Identifies the operating system platform. For Microsoft Win32 on NT-based operating systems, RtlGetVersion returns the value VER_PLATFORM_WIN32_NT. Contains a null-terminated string, such as "Service Pack 3", which indicates the latest Service Pack installed on the system. If no Service Pack has been installed, the string is empty. Ok, now I know what I expect as a result: The structure RTL_OSVERSIONINFOW. Now, I just return to my initial goal: To execute the function via Olly. Because we are talking about a DLL (and to about an executable) I will do the following: After loading the DLL in Olly I will go to the address where my function is located and I will put there a new origin point, as you can see in the next image. Image 3: The new origin point is the address of RtlGetVersion. 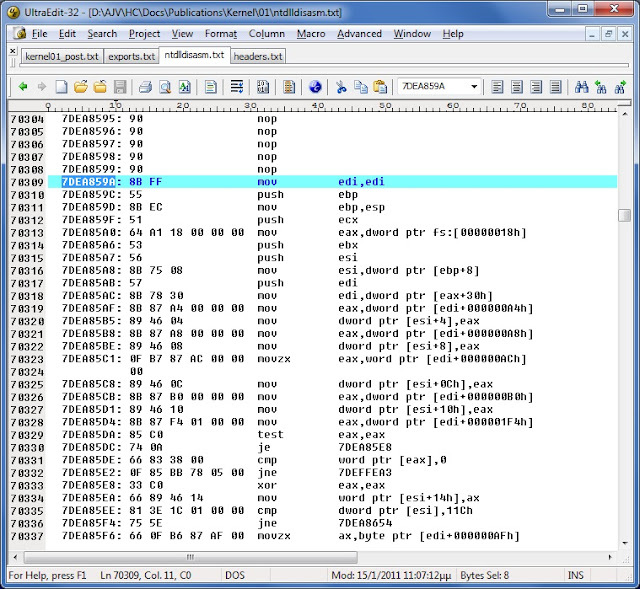 Note that the address of RtlGetVersion is not the same of what I get from the hexdump output. This is not odd and can be explained by the fact that the Base Address in each case is different. Image 4: The output of the winver command. Note the string "Version 6.1 (Build 7600)". I must see the same result after executing the function RtlGetVersion. Below there is an analysis of the code that I get from Olly with my remarks for the registers values I get. I suppose that the remarks are descriptive enough so no more are necessary. Very well. As you can see, I get the same results. 1. 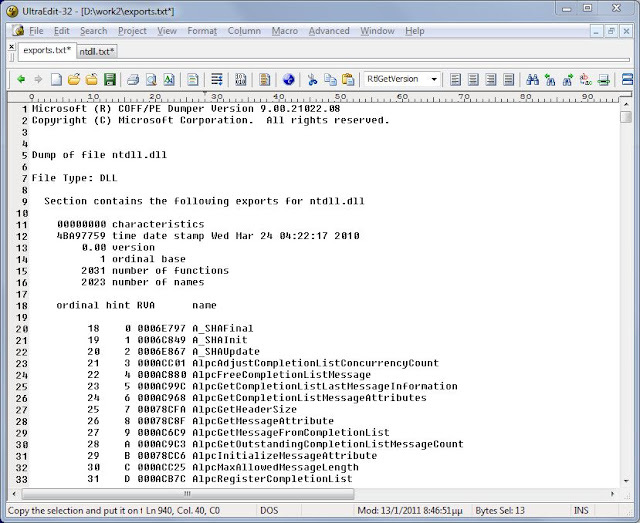 We see which functions exist inside the ntdll.dll. 2. We select and examine one of them. 3. We execute it and we get its result line by line by examining its source (disassembly) code. Be carefull when you mess around with native API functions. If something goes wrong it is very possible to freeze your system. If you search the internet you will not find many sources of how to call RtlGetVersion direct from Native API. So, I suppose that this code could put a small brick to cover this gap. The program is in C++ in Visual Studio 2010. Debug and disassemble this little program and repeat the procedure that we just describe above.